Rwanda's president, Paul Kagame, remained defiant in the face of growing international condemnation of his country's military meddling in the Democratic Republic of the Congo. Kagame rejected allegations at the UN on Thursday that Rwanda was supporting a deadly rebel insurgency in the east of the DRC, saying: "Solving the crisis will be impossible if the international community continues to define the issue erroneously." The rebel militia M23, led by Bosco Ntaganda, a warlord wanted by the international criminal court, has been fighting government soldiers in eastern Congo's North Kivu province since April. An estimated 470,000 people have been forced to flee their homes. On Thursday, Kagame and the DRC president, Joseph Kabila, met Ban Ki-moon, the UN secretary general, and member states on the sidelines of the UN general assembly in New York. "Most participants strongly condemned all forms of external support to the M23 and other negative forces in the DRC, and demanded the immediate and permanent cessation of such support," a summary of the meeting said. "Some participants cautioned that those supporting the M23 could also be held accountable. "They stressed … the urgency of constructive engagement and dialogue between the DRC and Rwanda." Despite Rwanda's robust denials, a senior UN diplomat told Reuters that in private the Rwandan government was "a bit embarrassed, to say the least, and this could be one of the reasons behind the lull [in fighting] in the Kivu". 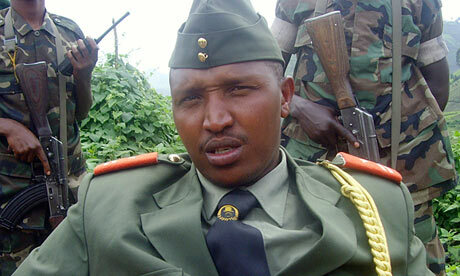 He said if Rwanda withdrew support then the M23 group, which numbers about 1,500 fighters, "could be subdued". This week Rwanda's biggest aid donor, the EU, joined several countries in partially freezing its financial support until the issue of Rwandan support for the rebels is resolved. Mark Simmonds, Britain's minister for Africa, told the UN summit: "There can be no possible justification for such support, whether in terms of military hardware, or strategic advice. It must stop. "And there can be no impunity for those who violate human rights. They must be brought to justice." France said it would support sanctions against M23 and warned neighbouring states against supporting the group. "The M23 is benefiting from external support, including from neighbouring DRC states," said Yamina Benguigui, the French minister for the Francophone countries. "Nothing can justify the support of an armed rebellion led by war criminals. All support of M23, whatever it is, must stop." Earlier this year a report by experts of the UN security council's sanctions committee accused Rwanda's defence minister, James Kabarebe; its chief of defence staff, Lieutenant General Charles Kayonga, and a Kagame military adviser, General Jacques Nziza, of being "in constant contact with M23". The DRC has asked for the security council to impose sanctions on the three men. The UN said it was working with east and central African states on their proposal for a neutral force to tackle the M23 and other armed groups in eastern Congo. The UN peacekeeping chief, Hervé Ladsous, told Reuters: "It is something that generates interest, but we are short of a real concept of operations – who would be in, who would do what, who would pay – and this is why more work needs to be done." Meanwhile, up to 12 people were killed in a series of night-time shootings and grenade attacks in the eastern Congolese city of Goma, raising fears that M23 is planning a new offensive. Witnesses told Reuters on Thursday that panic was spreading and youths equipped with torches and whistles had started organising watches to protect their neighbourhoods after dark. Alexander Essomé, the Goma-based spokesman for the UN peacekeeping mission, said: "For the past two weeks we have seen scores of killings, attacks with guns, lootings, illegal entering into NGO [aid group] houses, I can't even count them."